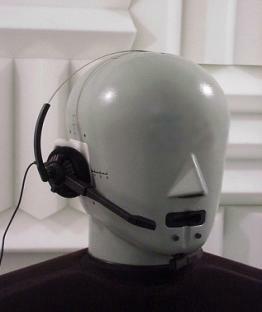 Acoustic testing and evaluation of any type of headset with a variety of ear simulators. Corded, Wireless, Bluetooth, Proprietary designs. Audio Testing of In-the-ear, on the ear, over the ear (insert, super concha, circumaural). Frequency Response, Noise, Sensitivity, Acoustic Shock, Distortion and other electro-acoustic tests. The secret of reliable headset testing is using the correct ear simulator (artificial ear) and carefully controlling the test conditions. There is no realistic way of acoustically evaluating these devices with “homebrew” fixtures. There are a plethora of headset vendors; some are quite good while others may be incompatible with your product. Acoustic, ergonomic, mechanical, aesthetic as well as electrical factors affect headset selection. Attention should be paid to the electrical interface in order to avoid noise. The headset jack needs to be robust enough to withstand abuse. 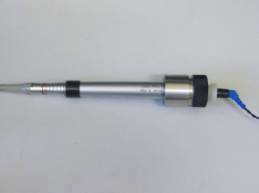 We use a Bruel and Kjaer 4228 HATS – Head and Torso Simulator - for testing most headsets. Headsets used for telephony should be evaluated along with the target product if possible. Specialized measurements, such as Loudness Ratings, (RLR, SLR, STMR) are needed for telephony products. We can test, evaluate and help debug your Bluetooth or other wireless headset system. Frequency Response, Noise, Distortion and Maximum Output Levels are common measurements. As with all wireless products, delay and noise can be a problem. High Performance headsets can be evaluated as well. Data can be referenced to the diffuse field or free field or the Drum Reference Point (DRP). Different manufacturers have their own preferences. The simulated program noise test signal is used in European Norm EN50332-1, and EN 50332-2, for measuring the maximum safe sound pressure level of headphones (acoustic shock). The signal tries to emulate the spectrum found in a variety of program sources including speech and music. 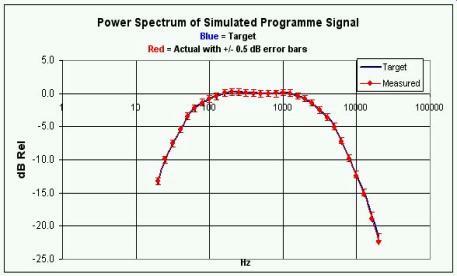 The graph to the right shows the spectral accuracy of our test signal.